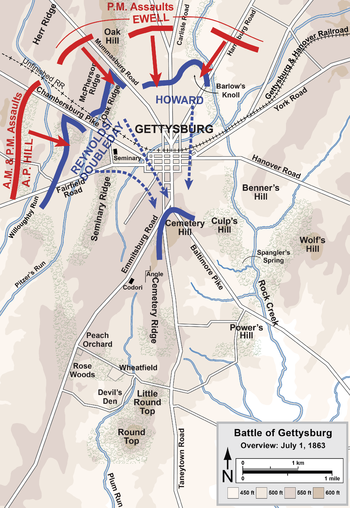 For your reference and convenience, this page reproduces five Gettysburg Maps by Hal Jespersen, www.cwmaps.com. 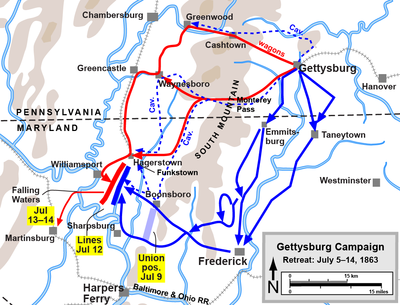 There is an overview map of the Gettysburg Campaign, one map for each day of battle, and then a final map that shows the Confederate retreat and the Union chase. These maps are distributed under the Creative Commons Attribution 3.0 license. They are free maps by Hal Jespersen, www.cwmaps.com, and available for download from Wikipedia. 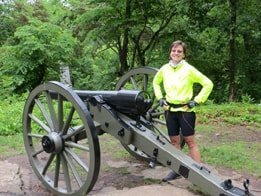 The text of this article was written under the Civil War Cycling website copyright. 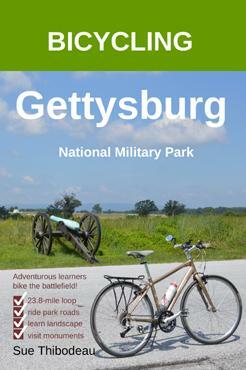 Please see Civil War Cycling’s Gettysburg Reading List for recommendations on books that focus on battle maps. 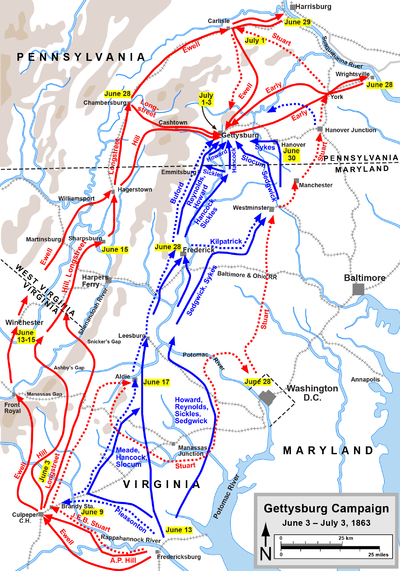 As this map shows, the Battle of Gettysburg started long before July 1, 1863, with a month-long campaign that brought Gen. Robert E. Lee’s Army of Northern Virginia across the Potomac River, through Maryland, and into Pennsylvania. Gen. George G. Meade’s Army of the Potomac was in hot pursuit. The first shot was fired at around 7:30 A.M. on McPherson’s Ridge. By the early afternoon, Confederate Maj. Gen. Henry Heth’s division was supported by attacks by Lt. Gen. Richard S. Ewell’s two divisions, one coming from Oak Hill and the other from the northeast toward Blocher’s (now Barlow’s) Knoll. On the Union left flank, the Confederates were challenged first by Union cavalry under Brig. Gen. John Buford, and then by Union infantry under Maj. Gen John F. Reynolds. On the Union right flank, the Confederates were challenged by Maj. Gen. Oliver O. Howard’s corps and particularly his division commander, Brig. Gen. Francis C. Barlow. 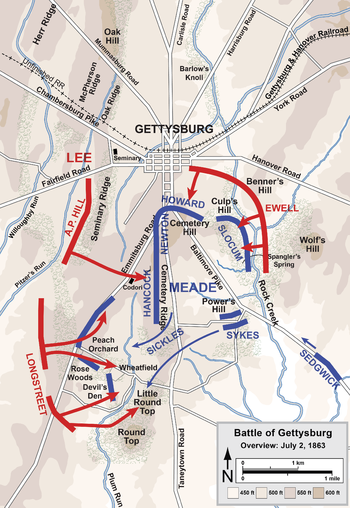 In the late afternoon, the Union line collapsed south through town. By the morning of July 2, Gen. George G. Meade’s Union army had established a defensive position in the shape of a fishhook. This map shows a westward bulge in the Union line that Meade did not authorize. Union Maj. Gen. Daniel E. Sickles moved his 3rd Corps to away from Little Round Top in order to place his artillery on the rise near Emmitsburg Road. At about 4:00 P.M. Confederate Lt. Gen. James Longstreet led a wave of attacks on the Union left. Confederate Lt. Gen. A. P. Hill attacked Cemetery Ridge through a gap in the Union line near Codori Barn. At about 8:00 P.M., Confederate Lt. Gen. Richard S. Ewell attacked the Union right at Cemetery and Culp’s Hills. Meade’s defensive formation on high-ground had held. 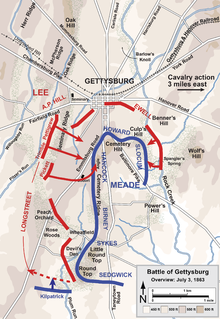 Meade ordered the return of five Union brigades to Culp’s Hill, where Brig. Gen. George S. Greene had built a strong breastwork defense. At about 3:30 A.M. on July 3, Union infantry attacked the Confederates, and by 11:00 A.M. forced their withdrawal. The fighting on Culp’s Hill ended. At about 1:00 P.M., Confederate artillery on Seminary Ridge started an almost two-hour bombardment of the Union line on Cemetery Ridge. For the most part, the guns overshot their mark. Then finally, at around 3:00 P.M., after a nod from Lt. Gen. James Longstreet, Maj. Gen. George E. Pickett led more than 12,000 Confederate soldiers eastward across a one-mile open field to the Union center. First under artillery fire and then under rifle fire, the Confederates were slaughtered. About half would survive to return to Seminary Ridge. Gen. Meade’s Army of the Potomac did not attack Gen. Lee’s Army of Northern Virginia on July 4. On July 5, Lee started his retreat back to Virginia. President Abraham Lincoln anguished that Meade “had the enemy within the hollow of [his] hand,” but allowed Lee to withdraw. The war continued for almost two more years.